USA Patriotism! proudly recognizes . . . country music group Little Big Town for their ongoing support of our troops through their performances and other efforts. "We had been in Afghanistan for over a week, and we were having the time of our lives visiting with and eating meals with the troops and doing shows for them at night. One morning we took a Chinook helicopter way out into the desert to Teran Kout, a remote and very dusty camp in Afghanistan. The dust came up to our ankles and the texture was like baby powder. 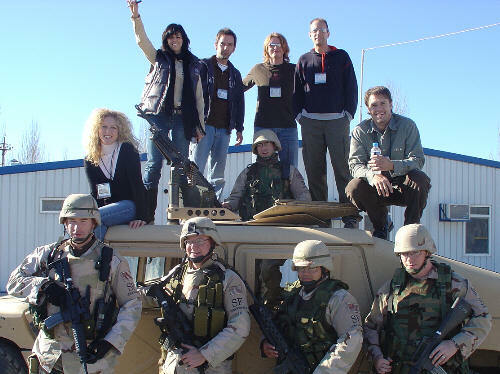 We were so struck by the humble accommodations these very special troops lived in. There were no buildings, only tents. There were no bathrooms, only pipes that stuck up out of the ground (that was a first for me) and one port-a-potty. We spent the day visiting the guard posts sites at the edges of the camp. The men and women who stood guard there would not be able to join us for the show, so we wanted to see them personally and make sure we let them know just how much they were missed and loved at home. Later that day, we did sound check on a concrete slab that was the future site of their new dining hall. (I think that would be their first actual building on the camp.) At dusk, we did the show there on that slab. I don't think any one of us will forget the picture of that group of very hard working men and women who came to see the show. There was no “seating”, so they brought make-shift chairs and blankets to sit on and some of them were piled onto their tractors and other building equipment. That show was the most gratifying, memorable show I have ever participated in. The memory brings tears to my eyes. After the show, we ate dinner with the troops. (That was one of the most fun times of every day for us because we all split up and sat amongst them and listened to their stories and filled them in on the happenings at home.) After dinner, it was dark and with no lights on the campsite, there was nothing left for us to do but hit the hooch! Karen and I made our way to the girls' hooch's along with our blankets – it was very cold when the sun went down. And Jimi and Phillip went their way. Karen and I had a hard time going to sleep that night because it was so cold and our blankets were very thin. I realized then how spoiled I am when it comes to temperature comfort! As we lay there, we each heard in the distance what sounded like a bomb. We didn't say anything to each other because it was a very faint sound, and we didn't want to disturb the other women in our tent, but it terrified us! A few minutes later, another bomb-type noise went off but this time very loudly and very close to us. Karen and I grabbed each other and began praying. Meanwhile, at the other side of the camp, Jimi and Phillip were having an impromptu sing-a-long with the troops. They later told us that when that loud burst happened, those troops scattered like wildfire! They immediately went into work-mode! Back at our tent, some of the women told us to stay put as they went out to check on things. We could tell they were a bit uneasy. After a few very frightening minutes, they came back inside, laughing, to let us know that on the far side of the camp, they were testing mortars and didn't warn anyone of it. It was mortar fire. That was the biggest relief of my life!! It's funny as I think about it now, but that night I realized that those men and women experience that kind of fear everyday. They are extremely brave, and I have the utmost respect for their sacrifice. Each one is a true hero!" "Traveling to Afghanistan was one of the highlights of our career. We went over there to encourage them and in return we were the ones who were blessed. We have been fortunate to do a lot of really cool things over the last seven years as a band, but the thing I am most proud of . . . is having the chance to entertain the men and women who protect us everyday. It was truly life changing. They are very special people."